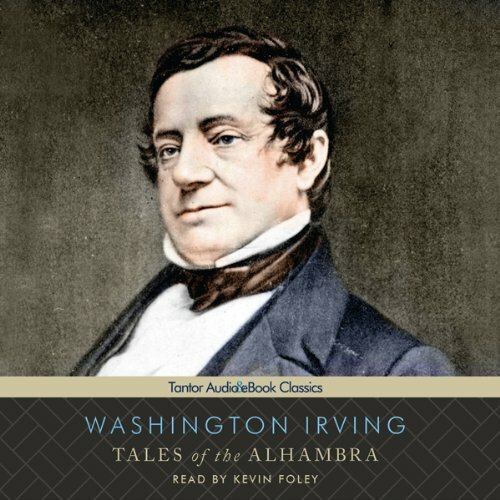 One of the most entertaining travelogues ever written, Washington Irving's Tales of the Alhambra is a heady mix of fact, myth, and depictions of secret chambers, desperate battles, imprisoned princesses, palace ghosts, and fragrant gardens, described in a wistful and dreamlike eloquence. Irving, who also penned "Rip Van Winkle" and "Sleepy Hollow," wrote Tales of the Alhambra during a stay at the legendary Alhambra in Granada, Spain. The Alhambra is a combination fort, palace, and gardens dating from the thirteenth century, filled with fantastic Arabic architecture (ornate plasterwork, ceramic tiles, sculpted marble fountains, and archways) and plenty of room for imagining the days of its former greatness, which Irving brings to life most memorably. Even though Tales of the Alhambra is over 170 years old, it seems as if it was written yesterday. There are tales of princes, genies, lost and found loves, enchanted treasures, battles, hellish headless horses, and commentary on the Spanish landscape and nature of the Spaniards that he lives with. Full of bewitching music, the smell of roses and exotic perfumes, fiery sunsets, and the ghosts of the past, Tales of the Alhambra is a sensory treat as well. In Tales of the Alhambra, Washington Irving recounts his 1829 sojourn from Seville to Granada and his stay in the marvelous Moorish castle-palace, the Alhambra. He engagingly describes the Spanish landscape and people and the Moorish civilization that played such a vital role in Spain for so many hundreds of years. Irving's writing is vivid, imaginative, beautiful, and witty. And he clearly loved the enchanting courtyards, gardens, fountains, rooms, decorations, inscriptions, towers, walls, and vistas of the "pile" that epitomized the romantic heart of Spain for him: "Perhaps there never was a monument more characteristic of an age and people than the Alhambra; a rugged fortress without, a voluptuous palace within; war frowning from its battlements; poetry breathing throughout the fairy architecture of its halls." In addition to telling the history of the Alhambra, Irving retells the tales set in or around it that he heard from local people or read in old manuscripts. The tales are humorous, eerie, or moving fantastic legends that feature Christian or Moorish characters from throughout the history of the Alhambra: ancient necromancers, chivalric knights, love-struck princes and princesses, talking birds, enchanted soldiers, phantom armies, foolish kings, sensual Padres, discreet duennas, spying barbers, punctilious governors, roguish bandits, proud poets, poor students, magical treasures, and more. Reader Kevin Foley is professional, but almost too bland and metronomic, so that at times I wished that Ralph Cosham had read this book, the full, revised, 13.5 hour 1851 edition, instead of the 8.5 hour 1831 first edition. Foley does spark into life when he reads Spanish or English with Spanish or Moorish accents or English spoken by a hawk, an owl, a bat, a swallow, a dove, a raven, or a parrot. And Irving is so excellent that I do recommend this audiobook for anyone who has visited the Alhambra or who is thinking of doing so. And for anyone who likes travel literature and Arabian Nights-like tales or who is interested in the Moorish empire and its influence on Spanish culture. I don't think I really need to mentioned why Tales of the Alhambra is a wonderful read. It's a classic of travel...what?...Fiction? The real issue here is the reading. Now in general, I would not say that Kevin Foley is not a good reader. He speaks in a clear if somewhat stilted manner (which could be partly because of the source material.) My real issue with his reading is the insistence of using what is some sort of, I don't know what... Mexican?...Accent. I find the use of this accent insulting as it makes the character (or persons) speaking it sound like dimwitted fools. This is an overall unfortunate situation. As many of the writers who visited Spain from the 1800's to the mid 1950's (Hemingway, Pritchett, Welles, and Michener) have a habit of portraying the inhabitants as ignorant, illiterate peasant fools. this greatly diminishes their writings on the subject. All of this is made worse when the audio book reader, like Kevin Foley does here, give the speakers a ridiculous and wholly inaccurate accent. Excellent performance for this marvelous book! This book is really a great read! You find yourself in two long gone worlds: that of 19th century Spain, and that of the old kingdom of Granada and it's legends.